TowBoatU.S. Fort Lauderdale - When Is It Salvage? In broad terms, courts define marine salvage as a voluntary service (meaning that there's no pre-existing agreement) rendered to a vessel requiring assistance because of a present or reasonably apprehended danger or peril. When a salvage service is provided, the salvor is entitled to a salvage award. As a TowBoatU.S. Ft. Lauderdale customer, we want you to know that a marine salvage takes place when we rescue your boat whether it is aground, on a reef, beached, stranded at sea, flooding, sinking or in any other number of situations. 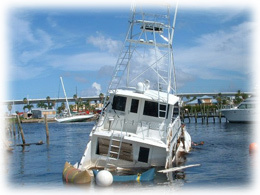 While your marine insurance policy may provide coverage for a salvage claim, your BoatU.S. Towing Services plan does not provide coverage for salvage. A salvage situation can arise in all kinds of situations. 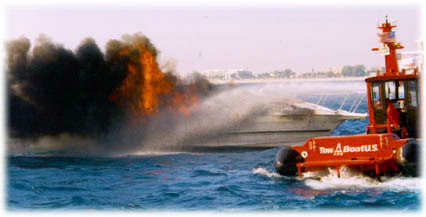 For example, assisting a vessel taking on water, extinguishing a fire, or pulling a vessel free from a reef will almost always be considered salvage. Captain Lawrence H. Acheson, founder of Offshore Marine Towing, Inc., describes salvage as being a mix of experience, ingenuity, and talent that a salvor must be prepared to deliver on a moment's notice. TowBoatU.S. Ft. Lauderdale takes great care in readying itself to render salvage services with top-of-the-line equipment, purpose-built vessels and with experienced, ingenious and talented personnel. TowBoatU.S. Ft. Lauderdale's captains are trained to inform you that the services they are about to render are salvage and you will be asked to sign our Standard Form Marine Salvage Contract. The contract is a two-sided sheet and contains, among other things, a requirement that the parties arbitrate any disputes. You can read a copy of our Standard Form Marine Salvage Contract by clicking here. We've performed thousands of salvages since our inception in 1989, and we rarely ever end up in a dispute that requires a formal proceeding -- most times we can reach an amicable resolution. In fact, our reputation in the marine community is impeccable, and we work hard to keep it that way. To help you better prepare to handle a salvage situation, we recommend you review your marine insurance policy and understand what coverage is afforded to you for salvage services. (It's always a good idea to call your insurance company or broker if you have questions as to what your policy does and does notcover.) We also strongly urge you to get to know your local salvor before you're faced with a salvage situation. Learn about their reputation within the community and find out their philosophy on salvage. Knowing who to call will make all the difference! Can't imagine what kind of trouble you might get into? We've seen it all, and more! For a detailed look at our Salvage Gallery, Click Here. Or, for a comprehensive listing of our past salvage work, please visit our Salvage Resume. What's the difference between towing and salvage? A good starting point is to understand how the courts see the issue. Generally speaking, the courts have explained that towage is merely speeding up a vessel's voyage without reference to any circumstances of danger. 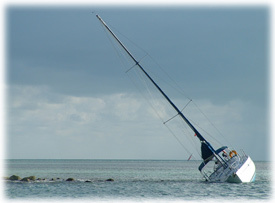 Of course every situation is unique, but generally if you need a jumpstart or a fuel drop or if you have a minor mechanical breakdown and there's no immediate or pending danger, TowBoatU.S. Ft. Lauderdale will generally treat the incident as a tow. On the other hand, where more serious circumstances are involved, the situation may give rise to a salvage service. Remember though, at TowBoatU.S. Ft. Lauderdale, we'll let you know right away (or as soon as practical) if the situation is salvage. For more information regarding the difference between towing and salvage, please click here.